What do you call a meal where people serve themselves or food that is arranged on a table? 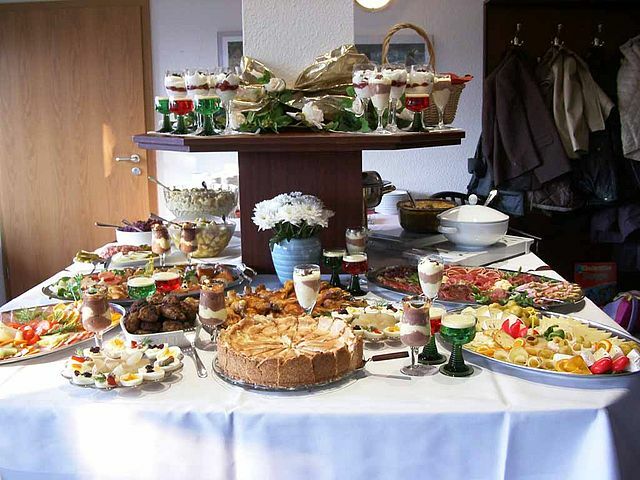 This type of meal is commonly referred to as a buffet, which is named after the French word for a piece of furniture it can be served on. 3 course menu, al carte, buffet etc. what do you call these “dining format”? What do you call it when some group is feeling self-satisfaction by praising themselves? What do you call this button-shaped thing? What do you call an area where people can pick up flyers/pamphlets? What do we call personnel who serve VIPs? What do you call these long rectangular tables you usually find at McDonald's? What do you call the person asking someone survey questions and recording that person's answers?